La Crèche de Noël | One quality, the finest. My siblings and me in 1972. I’m at the right with my brother hanging onto my arm. As long as I can remember, my family had une crèche de Noël (oon cresh duh no-ell), or a Nativity scene. Mary was a little worse for wear, with a chunk missing at the base. She had to be propped up by the manger. The wisemen had camels that appeared to be wearing lipstick. The stable was improvised by my Dad. Apparently, he used a balloon as a form for a papier-mâché structure that he spray painted gold. The stable also housed three cows whose horns were made of coiled wire, painted white, a donkey, a goat, and four sheep. Each year, the pieces were carefully set up on a length of glitter-embellished fake snow. This may sound like an odd collection of attributes for a sentimental favorite, but make no mistake, this crèche was deeply loved. Depending upon where we lived at the time, sometimes the crèche was set up on our mantel, sometimes on a side table. My parents acquired the pieces over a period of two Christmases from Woolworth’s in Windsor, Ontario in the early 60s, otherwise known as B.P.E., or Before the Patricia Era. In those days, they had three small children and barely two cents to rub together, so they had to pick and choose which pieces came home. The handpainted pieces were made in Italy, and although they cost less than a dollar each, they represented a splurge for the holidays. I was shocked a few years ago to discover that my younger brother was now the owner of the crèche. I was secretly (perhaps not so secretly) outraged. Clearly, this was a sign of parental favoritism! But I choked down my resentment and even bought him an intact Mary when he found it on eBay from a shipper who wouldn’t deliver it to Canada. Fast forward to December 2017. My husband and I went antiquing in New Bedford Massachusetts where we’ve had sensational luck in the past. In the first store we went into, I found my childhood crèche. I almost cried. Needless to say, it came home with me. 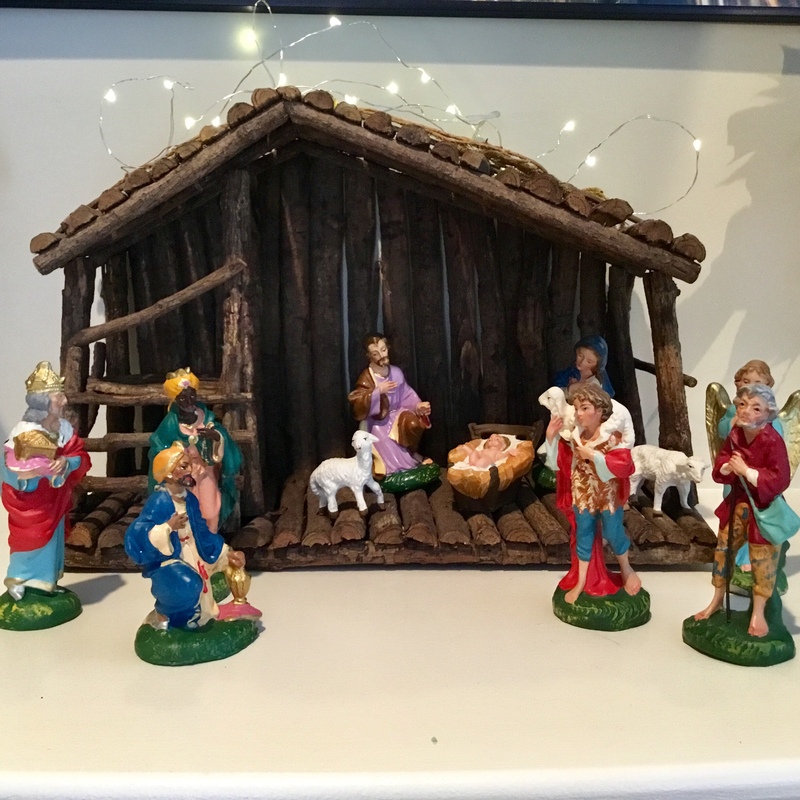 It had all of the same figures, plus an angel, another shepherd, and a stable that was admittedly an upgrade from the papier-mâché version of my childhood. 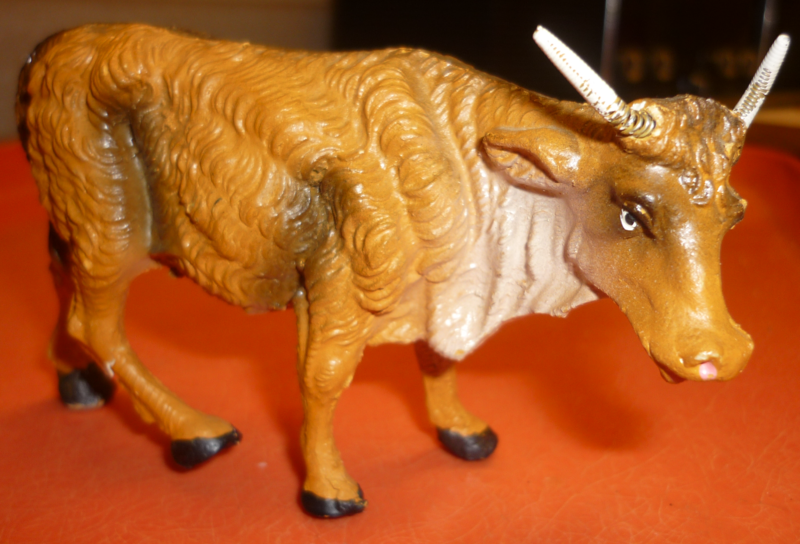 Other than a modest flock of sheep, one of whom was missing a foreleg, there were no other animals. So that gives me a new mission when we go antiquing. 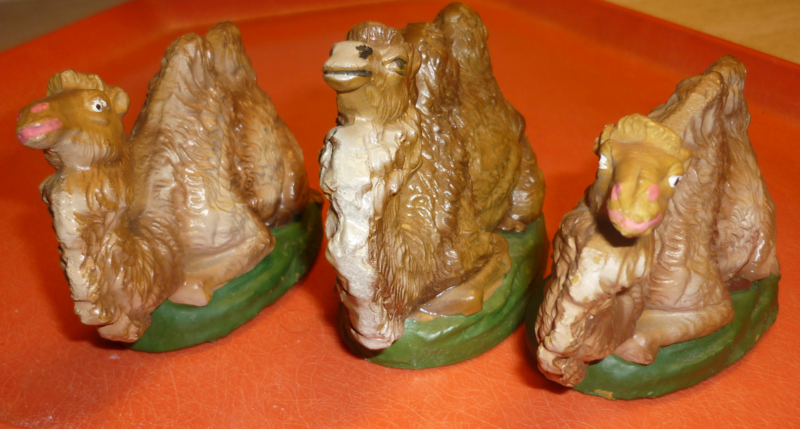 I’ve already found a camel, donkey, and cow on eBay. Can the rest of the barnyard be far behind? When I got home, I sent a photo to my parents and brother to tell them about my score. That’s when I learned that my parents had been planning to drop their crèche off at a thrift shop when my brother rescued it. It actually wasn’t proof that he was the favorite child. I’m glad that he saved a piece of our family history from oblivion and I’m glad that I get to save someone else’s. This entry was posted in Décor, Shopping and tagged antiques, antiquing, Christmas decorations, Christmas traditions, Nativity scene, New Bedford, une crèche de Noël. Bookmark the permalink. I can totally relate, except for the sibling rivalry, as I was an only child. My family crêche is very similar, surely the same Woolworth Italian type and vintage. It’s one of the few items that I decided to ship home when clearing out my childhood home after my mom passed away this year. The crêche is a tangible connection to the love and joy of Christmas past. It is in transit by ship. Won’t make it this Christmas, but if you rerun or link back to this post next year, we should have it up. My favorite figure was a resting donkey. Camel and baby Jesus a distant second and third, I must admit. Joyeux Noël à tous! We had the exact same set, which I set up yesterday at my mother’s apartment in the retirement home where she now lives. We have three sheep, but only one camel. I guess the wise men had to share! I expect it was bought at Woolworth’s in Toronto c1955. The world is very small, isn’t it?